In a hugely disappointing outcome to a process that has been ongoing for several months, South Africa’s Department of Environmental Affairs (DEA) has ignored a Parliamentary Resolution calling for the phasing out of the cruel lion breeding industry, and instead has retrospectively issued permits to hitherto illegal breeding farms. In a complete turnaround from the strong condemnation of the industry he expressed at the August meeting, the Parliamentary Committee’s Chair, Mr Mohlopi Philemon Mapulane, was quoted as saying only that “for me, we appear to be making progress”. There are thought to be between 9,000-12,000 lions on as many as 300 breeding farms across South Africa. These animals are typically ripped from their mothers at just a few days old to bring her back into breeding condition, and exploited as photo props and tourist attractions. Ultimately many end up as victims of canned hunts, or being slaughtered for their bones which are sold into lucrative Asian markets. The DEA reported that, of 227 breeding facilities inspected, nearly 40% were non-compliant with current regulations, including large numbers that were operating without the necessary permits. Instead of fining or closing them down, astonishingly, the authorities simply issued permits to most of the offending facilities. 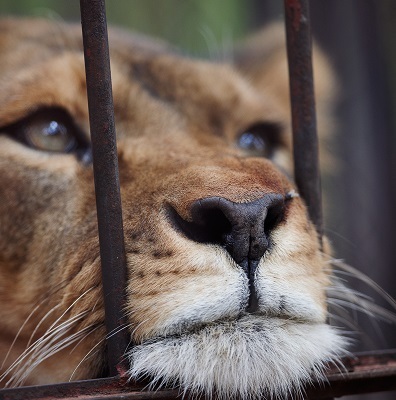 The only concession to the Parliamentary Resolution was that legislation will be introduced to restrict permits to lion breeding facilities “that can demonstrate how the breeding in captivity of such specimens will contribute to the conservation of the particular species…”. Given the South African government and the Parliamentary Portfolio Committee both acknowledge that the lion breeding industry serves no conservation purpose, this sounds positive, however we have little faith that it will result in any significant reduction in lion breeding for commercial purposes. Born Free will continue to work with colleagues in South Africa to expose the industry, and achieve the Parliamentary Resolution’s original recommendation to “urgently initiate a policy and legislative review of the Captive Breeding of lions for hunting and the lion bone trade with a view to putting an end to this practice”.